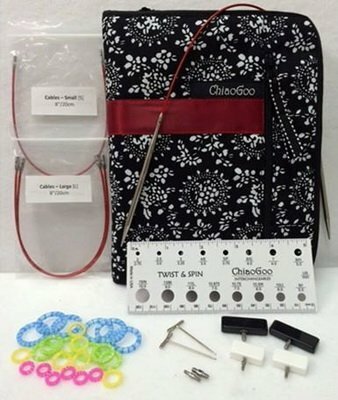 The ChiaoGoo 4" Red Lace Twist Complete Interchangeable set features the same stainless steel needles and red twisted steel, vinyl wrapped cords that you know and love. The needle tips feature a lifeline hole that makes adding a lifeline as simple as knitting across the row. The sets come packaged in an elegant black and white case. The case is compact (6" x 8" closed) with 29 inner pockets for tips and one outside zippered pocket. 13 pairs of 4" needle tips. US sizes 2, 3, 4, 5, 6, 7, 8, 9, 10, 10.5, 11, 13, and 15 / Metric size /s 2.75, 3.25, 3.5, 3.75, 4, 4.5, 5, 5.5, 6, 6.5, 8, 9, and 10 mm. 2 @"S" and "L"cords to make circular sizes 16"